Updated 12/18/2013: My current Thrift Savings Plan allocation remains 100% in the TSP S Fund. News about the stock market has been dominated since Thanksgiving by the prospects for the Federal Reserve to begin tapering the Quantitative Easing program. You will recall that QE refers to the Fed pumping $85 billion a month into the financial system by buying US Treasuries, which has had the effect of keeping interest rates extraordinarily low for a long period of time. Of course, they can’t keep creating money out of thin air forever, so the plan has always been to gradually cut those purchases down and eventually eliminate them all together when the economy becomes strong enough to continue to grow without artificially low interest rates. The FOMC (Federal Open Market Committee) has hinted repeatedly in past months that they are nearing the point where that taper will begin. This has put the market into a quandary – when good economic data comes in (like the November jobs report) which should send the market soaring, this news is seen as making it more likely that tapering will begin soon and has caused the market to sink. The market can’t agree on what impact tapering will have – some experts believe it will have a negligible effect because the economy is doing so well, others believe it will significantly slow the upward trend the market has been displaying or even result in a drop. 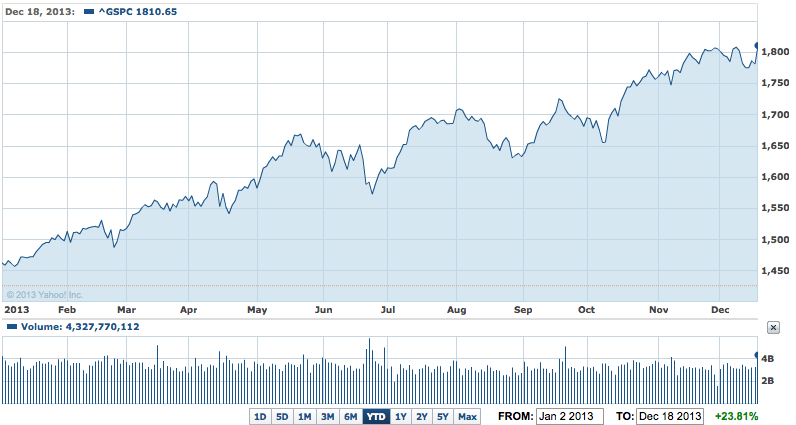 In the face of uncertainty, the market has been turbulent for the past few weeks. It has mostly been trading sidewise despite the lurid internet headlines and splash screens on the “business” networks. They are trying to sell ads. This is the story which will get them eyeballs these days. The more dramatic they make the story, the more eyeballs they get and the more money they make. My preference was for the FOMC to start the taper now and end the uncertainty, so today’s news that they are going to gradually start to reduce QE and the way the market handled it was the best case scenario. Interest rates will probably spike up a bit in reaction to the announcement (which will be bad for anyone buying a house in the near term and anyone invested in the Thrift Saving Plan’s F Fund), but I believe both the stock and bond markets will settle back down in short order once it is clear that our $16 trillion economy can muddle through without that prop from the Fed. I will largely ignore all of the angst among analysts on CNBC, comfortable in the knowledge that QE is coming to an end because the economy is growing, and that when the economy is growing the stock market follows along every time. 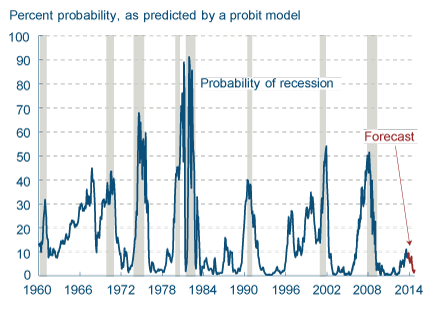 We may very well get a bad month or two in there, but predicting which ones they will be would be pure luck and the upward trend in this part of the economic cycle will more than make up for it. The unemployment rate declined from 7.3 percent to 7.0 percent in November, and total nonfarm payroll employment rose by 203,000. As you can see in this chart, the unemployment rate continues to decline which is symptomatic of the recovery phase in the economic cycle. Money Supply M2 in the United States decreased to 10938 USD Billion in November of 2013 from 10953 USD Billion in October of 2013. Typically what we are looking for is an expansion in the money supply, as this indicator is often a leading indicator of GDP growth. In the absence of other indicators of potential trouble, I won’t put much weight on single month of contraction. If this trend continues, however, we will have to dig deeper to figure out if this is a signal we should be concerned about. (3) the stock market: new all-time highs today for both the DOW and the S&P 500. Not much analysis to do here. Economic activity in the manufacturing sector expanded in November for the sixth consecutive month, and the overall economy grew for the 54th consecutive month, say the nation’s supply executives in the latest Manufacturing ISM Report On Business ®. The PMI registered 57.3 percent, an increase of 0.9 percentage point from October’s reading of 56.4 percent. 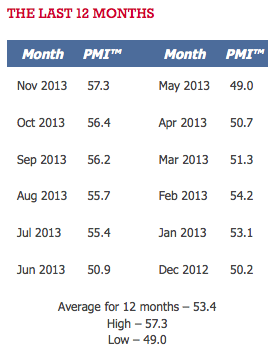 The PMI has increased progressively each month since June, with November’s reading reflecting the highest PMI™ in 2013. So again, all of the indicators are pointing in the same direction, and I believe that we remain in the Expansion/Recovery Phase of the Business Cycle for all of the reasons which I described in my earlier post on The Business Cycle Theory of Investing. And so I remain 100% invested in the TSP S Fund. TSP C Fund: I believe the C Fund will perform well over the next quarter, perhaps even on par with the S Fund. But historically, in this phase of the business cycle the S Fund will outperform and, notably, we are approaching “the January effect” – the month during which small caps nearly always outperform large cap stocks. TSP I Fund: The economies which underlie the TSP I Fund continue to have very mixed data. High unemployment rates and low GDP growth in Europe leave me unconvinced that the TSP I Fund is likely to outperform the domestic funds. For that reason, I won’t consider the TSP I Fund until I see stronger signs of growth. It may well have some strong months going forward, but I don’t see a basis for predictable gains. TSP F Fund: The Fed’s taper of Quantitative Easing will likely result in interest rates beginning to trend up, which will result in negative returns for the TSP F Fund until they stabilize (see the F Fund vs G Fund post for the details on why that will happen). TSP G Fund: The G Fund would be my safe haven of choice these days, if I needed a safe haven. 1.5% annual return is dreadful, but it beats negative numbers which you might well see with the F Fund going forward. TSP L Funds (the lot of them): If an investor just doesn’t want to bother looking at things for 40 years, a Thrift Savings Plan Lifecycle Fund would be better than the default TSP G Fund. But if you have read this far you clearly have the initiative to take a look at where we are in the economy once a month or once a quarter and do something smarter with your money. As an aside, whenever I refer to my allocation, that reflects both my contribution allocation as well as where my existing balances are invested. When I change my Thrift Savings Plan allocation, I both change my contributions and do an interfund transfer to reflect my current fund choices. If you found this update useful, it would mean a lot to me if you would help us get the word out and share it with your friends and colleagues using the email and social sharing buttons below.